After exploring Mason’s Falls in Kinglake National Park, my friends Scott and Roya were happy to continue exploring. I hadn’t even heard of Wombelano Falls at this point. I was instructed by Scott to get up Google and see if there were any falls nearby the area. Well, I ate my words when Wombelano Falls popped up on the search results. 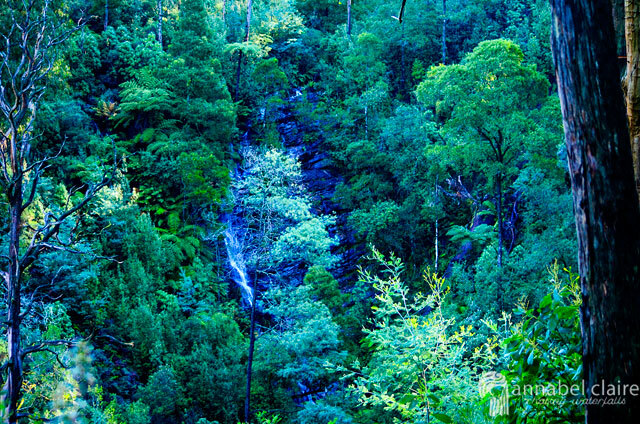 A mere 15 minutes away from Masons Falls in Kinglake, we decided to head that way. After the last roundabout, continue for 13kms, turn right onto Whittlesea-Kinglake Rd/C724 and from here the directions are the same as above! The ‘dirt road’ I’m referring to is fairly hectic, with lots of dips (half of the road was missing at times) and watery potholes. I was thankful we were in a 4wd. The walk to Wombelano Falls is a circuit back to the carpark. We began straight ahead, if not slightly to the right. Indicated by an orange arrow on a tree. Speaking of trees, the surrounding forest was magical. We were taken along a zig-zagging path, making its way down the hill. I was in my Nike free runs – a poor choice for this day when the ground was still damp and muddy from recent rainfall (no, still not enough to fuel our waterfalls unfortunately). In the middle of chatting to Roya about making camembert cheese-melt inside a loaf of bread (literally the best thing ever), I suddenly slipped, flailing my arms about and sliding with every stumbling step I made. Somehow, I managed to stay on my feet – just. Scott and Roya were gasping, asking if I was okay. Meanwhile, I got a severe case of the giggles. We slowed and I crouched over in a fit of laughter. Finally, I calmed myself and took another step, but I slipped again – Scott grabbing my arm to steady me – and I lost it laughing again. Moral of the story? Wear proper shoes. For some unknown reason I had chosen to leave my Kathmandu hiking shoes* at home. This wouldn’t have been such an issue if my Nike’s still had their soles, but they are so worn that they are flat and devoid of any grip. So basically, wear something with groves so you don’t end up like me. Once I had sorted out how to walk carefully downhill, we continued on. The ‘circuit’ is actually a halfway point on the track. So once you reach the platform, you have to head back up the way you came. You can then follow the path to the right, or go back towards the left. Obviously, we continued further downhill towards the falls. Soon, we saw a trickle of water peaking through the lush greenery. We continued closer, and found our way to the viewing platform. To my dismay, the viewing platform was quite a distance away from the falls, and the lack of decent rainfall had reduced their impressiveness. It was difficult to get good shots from this distance. To the right of the viewing platform, a section of the wood left a gap that you could slip behind – if you were careful. What resembled a path then meandered down into the thick forest, though it was extremely steep. Scott decided to venture down, becoming engulfed in the greenery. Roya and I could see glimpses of his blue jacket, until he disappeared. I slid under the railing and started to head downhill. But the path was ridiculously steep – and we had already established I was in the complete wrong shoes for muddy terrain. I took a few more steps, careful not to slip on the steep, tree-root invested path. I was not convinced it was a man-made path – it appeared to have been washed out with water and somehow created by nature. But I did want to get to the bottom of the falls. A few more steps and I froze. I realised I was going to have to head back uphill. Afraid I wasn’t going to make it in my shoes – and with my level of fitness, might I add – I headed back up to the platform, where Roya was anxiously waiting. Most of the time, I take risks when it comes to waterfalls. But that day I had to use my better judgement. I’ll just have to go back one day when I’m more prepared – geared up with my Kathmandu boots and backpack full of my portable charger, first-aid gear and plenty of water. I snapped a few more shots while other adventurers came and went from the platform. Scott was no where to be seen, and Roya and I started to panic. What if something happened to him while he was down there? I imagined a broken leg, or worse. Not to mention the fact that he was our ride home. “Cooooooweeeeee,” I cupped my hands around my mouth and called towards the forest below. No reply. Passers-by asked us what we were doing. We laughed nervously, “Ah, our friend went down there and he’s disappeared.” We must have sounded like lunatics. Then, through the green ferns, I spotted a flash of blue. “Sup,” Scott replied. Roya and I breathed a sigh of relief. We had our ride home! Oh, yeah, and Scott was safe, so there was that. “Did you get to the base of the falls?” I asked excitedly. I vowed then that one day I would return to find it. So watch this space for updates! We headed back up towards the carpark, through the green luminous ferns and towards an evening of camembert cheese-melt inside a loaf of bread. And yeah, it was yum. Native fern in surrounding forest.